Peripheral vascular disease is a disease of arteries of the body other than those of heart and brain. The peripheral vascular disease is mostly seen in the arteries of the legs. Hence it is also known as peripheral arterial disease. Most common cause of PAD is plaque build up in the lumen of the arteries. These plaques are formed in individuals who have high levels of cholesterol, high blood pressure, diabetes, obesity and habit of cigarette smoking. They are more common in males. The occurrence of PVD is higher in the age group more than 65 years. These symptoms and the underlying cause if left untreated may give rise to complications such as infection of the legs and gangrene. Leg might even have to be amputated if the infection cannot be controlled. The diagnosis is mostly done on the basis of the symptoms and the clinical examination performed by a endovascular surgeon . Brachial plexus index is the confirmatory test to diagnose the peripheral vascular disease. Angiography, USG, MRA and CT scans are also useful in the diagnosis of PVD. The PAD is treated according to the severity of the disease. If it is in initial stages, lifestyle modifications like smoking cessation, management of concomitant conditions like obesity, diabetes and hypertension, medications like statins to lower the levels of cholesterol, anti- platelet agents which help in reducing blood clots. Regular exercise will also help in reducing the progress of the disease. Even after all these treatments, the symptoms persist then the patient will have to see an endovascular surgeon in hyderabad or interventional radiologist. Vascular specialists in Hyderabad are the pioneers in the field of angioplasty and peripheral stenting. The angioplasty procedure was first performed. Under the guidance of imaging, the endovascular surgeon inserts a catheter (a flexible wire) through the femoral artery in the groin, to the location of the plaque in the blocked artery. Then the endovascular surgeon inflates a balloon present in the catheter. This balloon after inflation causes the blocked or narrowed vessel to open up. If the opening is not remaining patent or the walls of the arteries are collapsing against each other even after inflation, a stent (metal mesh tube) might be put in place. The stent hold the lumen of the arterial wall in place. 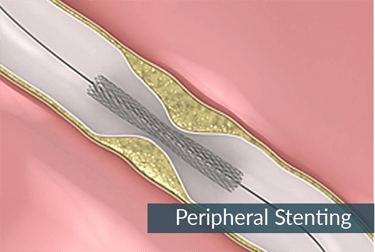 This stent is cylindrical in shape and made up of metal. This treatment is minimally invasive. A very small incision needs to be taken to introduce the catheter. Traditional invasive surgery has now a very strong alternative in the form of balloon angioplasty and stenting. In traditional invasive surgery, there is larger incision and more area is exposed making the patient prone to infections and post operative complications. Where as in, balloon angioplasty the incision is very small; there is less risk of bleeding, infections and post operative complications. The recovery time is also less in balloon angioplasty and peripheral stenting. Do you think you might be suffering from peripheral vascular disease? Consult Dr.AbhlilashSandhyala, best endovascular surgeon Hyderabad , to get safe and complete treatment of the Peripheral Vascular Disease.